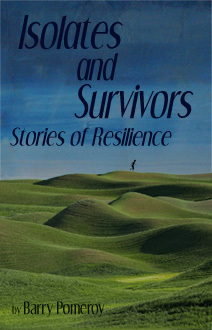 Isolates and Survivors began as a collection of stories about hardy, tenacious people and how they overcome their grueling circumstances. It quickly ballooned as I became aware that I was drawn to the notion of self-reliance and the ability to endure. I respect those who maintain themselves even while everything is taken from them. In this collection people suffer mental instability, find everything they know to be true is wrong, and yet still reach out tenderly, even though the world hands them stones on their cracked plate.